Harriet Harman launched the party’s new Woman to Woman campaign in a pink bus in Stevenage. It attracted rather a lot of attention. STEVENAGE – Labour launched its women's campaign on Wednesday but not everything went according to plan. The party had already announced that senior Labour figures such as Harriet Harman will tour the country in a pink 16-seat minibus to highlight policies on domestic violence, childcare, and the NHS. But Wednesday's launch was not entirely smooth, with most of the debate focusing on Labour's decision to choose a pink bus for the campaign. Moments before Labour’s pink bus arrived for its launch at Stevenage Arts and Leisure Centre, a small red car headed straight for the bus's reserved space. Dozens of female party supporters clutching balloons and placards looked on in bewilderment as the elderly driver refused pleading from press officers to park elsewhere. He parked up, got out of the car, and shook his head slowly at the crowd. This was not going to be an easy ride. This is Labour’s Woman to Woman campaign, for which leading party figures are travelling around the country in a pink bus. All day long, deputy leader Harriet Harman fended off questions about the colour of the bus, insisting cheerily that it was chosen because it is “conspicuous”. But at the first event of the day, in Stevenage, Hertfordshire, she was rudely interrupted by this man: Bobby Smith, an HGV driver. Man intrudes on Harman's chat with women to ask why she's not talking to men. 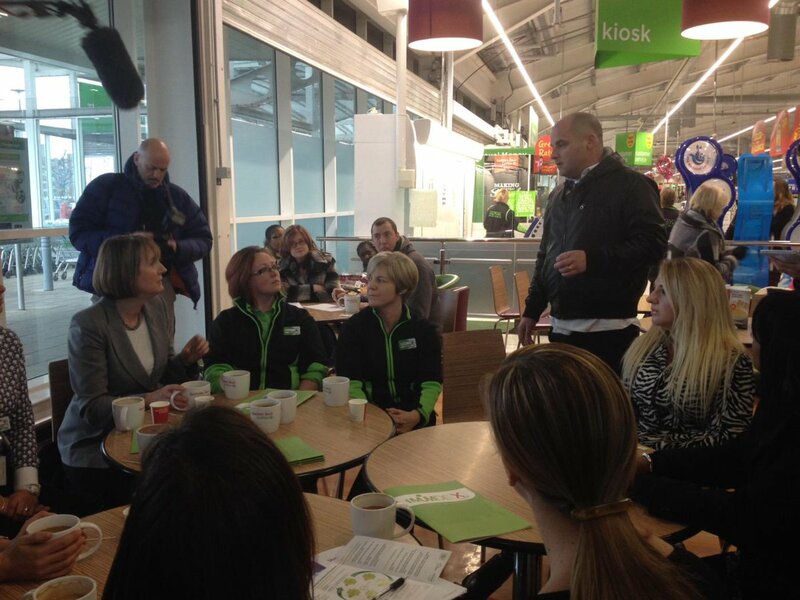 He went up to her in Asda, where she was talking to female workers, to ask her what she was doing for men. The women sitting around Harman told him to go away. But later he showed up again – this time outside the leisure centre. He stood behind Harman as she did a TV interview, holding aloft a bright pink placard. Later he told BuzzFeed News that Harman was simply ganging up on men. “She says it’s about equality but it’s not. It’s not a blue bus, is it?" Meanwhile, as Harman battled on with endless rounds of media interviews about the colour of the bus (“It’s really not about the colour”) the bus itself was starting to cause chaos. Driver Caroline Adams, an officer with the parliamentary Labour party, had been told to park it in the middle of the lane right outside the leisure centre. But some people were getting pretty cheesed off with not being able to get past. "Oi!" shouted one man. "You've had long enough now, move on. Can't you do this in the town square!" The bus was moved out of the way so passing cars could get by. BuzzFeed News tried to talk to Adams to see how she was doing but she was immediately ordered not to talk to the media. This is Caroline the bus driver. She's been told not to talk to the press, sadly. Female Labour activists at the event defended the colour of the bus and said it really wasn’t a big deal. One young woman wearing a pink jacket, who refused to give her name, said: "I just want to talk about the issues women face, from childcare to housing. This is neither here nor there. Maybe it'll get people talking and get more women voting." Harman added: "We wanted it to look conspicuous and therefore a white van was not going to do the job." The bus will tour more than 70 constituencies across the country as Labour figures talk to women in workplaces, at schools, and on the doorstep.